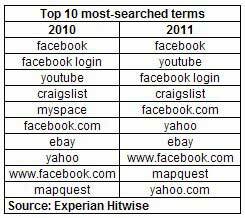 Facebook was the most popular search term and the most popular website in the US in 2011, according to an Experian Hitwise analysis of the top 1,000 search terms for 2011. In the search-term category, Facebook took top honors for the third consecutive year, accounting for 3.10% of all searches conducted in the US, up 46% from 2010. Below, other findings from Experian Hitwise. Four variations of the term "facebook" were among the top 10 terms during the year, accounting for 4.42% of searches overall, up 24% from 2010. "Youtube" moved up to the No. 2 spot in 2011, from No. 3 in the previous year. "Facebook login" was the third most-searched term, followed by "craigslist" and "facebook.com." "Facebook.com" moved up one spot in 2011 to rank among the top five search terms.